When you first think of landscaping your backyard, you don't immediately think of rock. You've probably considered flowers, a garden, a fountain, or a pond water feature to add to your outdoors. But, utilizing patio stones in your outdoor living space or garden will add a lot of elegance and save you work in the long run! Rock Beats Wood Instead of installing a wood deck, you should invest in a stone patio area. Decks chips, splinter, rot, and provide cozy nesting areas for all kinds of reptiles and rodents. A stone patio will give you that uniform, cohesive look without the maintenance. Stone Works with Everything Want to put a fountain out on your patio? Go ahead, splashing water won't hurt the brick at all. Want to enjoy a fire pit? The heat or fire won't disrupt the look of stone at all. Whereas with a wooden deck, you need to get special pads to protect the wood from the firebowl heat. Stone can resist the effects of a fire pit without worry. Want to get a patio furniture set? No problem! You don't have to be restrained by the type of furniture you want because you're afraid the furniture might scratch your wood or tile. Stone is nearly invincible. Saves You Time and Money Think of all the gasoline your push or riding lawn mower takes. Think of the cost of aerating your lawn, watering it, spreading seed, raking it, and spreading fertilizer to get that nice, thick lawn. It takes my husband an hour and a half to mow the lawn, and depending on the summer rains, he's mowing once every few weeks. Besides the cost of supplies, what is your time worth? Saves You As my grandmother is getting up in years, I get worried about her maneuvering outside on her deck. When it rains, the wood can get very slick, and I worry about her slipping on the way to her driveway. Paving stones have high abrasion and come in slip resistant styles. This is an especially good idea around your pool or pond, so people can walk around in safety. Besides all the time and cost benefits, patio stones can really punctuate the style of your outdoors. They can function as highlights, outlines, or texture to add visual interest to your outdoor living space. Look at this beautiful set up, on Sunset.com 40 Ideas for Patios. The light color of the stones highlights the deeper green hues of the garden. 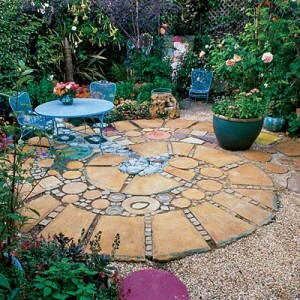 The way it is arranged makes the floor of the patio a mosaic piece of art. Clearly with this design, you can incorporate the ground as part of your decor. In this patio design, found on induexpo2007.com, the patio stones define and outline the patio area. I like the irregular shapes of the stones, and the rocky outline around the patio area. You can define your outdoor living space and mark its boundaries by simply using stone. This is a nice combination to include stone in your backyard without completely getting rid of your lawn. Granted, you still have to mow this walkway, but this way, the stones are given some definition with the green grass outlines. All in all, patio stones are an easy, do-it-yourself way to add texture and define your outdoors at a pretty affordable rate. It's a great creative outlet for those like myself who don't quite have the green thumb.